Here we go again. Living the good life means gaining a few pounds and starting to acquire the shape of your average couch potato, but with two weeks of preparations I was – against my own expectations – able to complete the 10km scenic run in one hour and one minute. Thanks to the great organisers and my special supporter. See you next year! 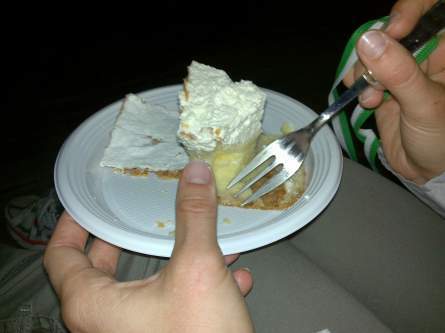 PS: pictured is the traditional prize for the runners – the Bled cream cake or what’s left of it. I’m sure you both earned it! @Adriaan: Joining us next year? 🙂 Trade you a cow ball. Ali pokrova sploh ne poješ, ali pa ga pustiš za konec, ker je najboljši?